This is the item requested by my returning customer that usually orders Pokemon. He has decided to have me work on a few self-designed adaptations of Pokemon and other popular characters. 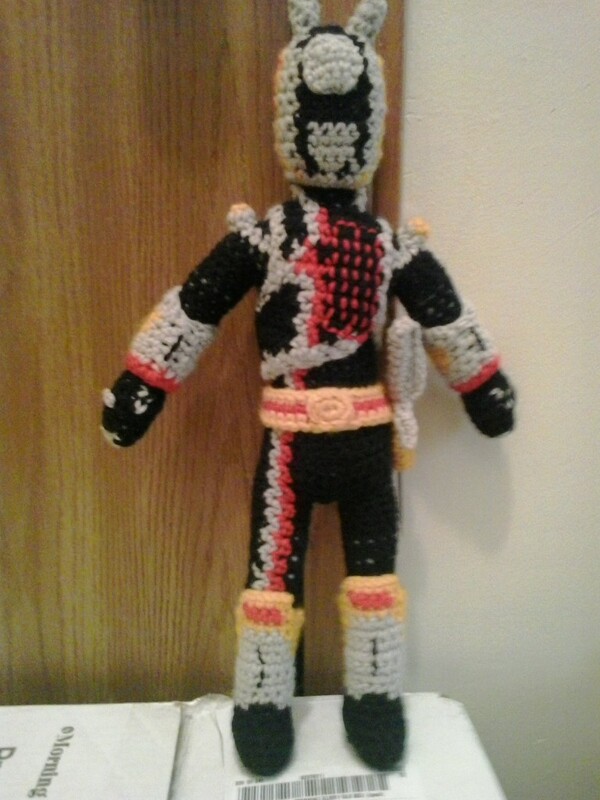 This character continues a series of Power Rangers that he has requested. S.P.D. Shadow Ranger was not as easy as the other Rangers because how I had to do the BREASTPLATE and the lines red and gray going up the right leg and body that had to match the lines on BREASTPLATE. If anyone has any problems or questions about the pattern, please send them to me in the comments section below. Worsted weight yarn: Black, gray, red, and gold. BEGIN STUFFING ARMS FIRMLY. CONTINUE STUFFING AS YOU GO ALONG. Finish off. Using gray, embroider spots on hands where knocks would be. Rw 1: With red, ch 14, sc in second ch from hook. (13) Change to gray. Finish off leaving a long tail. Wrap ARM GUARDS around ARMS and sew seam closed. Using black, embroider black lines on both sides of gold spots on ARM GUARDS. Weave in ends. NOW WORKING IN RDS AGAIN. BEGIN STUFFING THE LEGS FIRMLY. CONTINUE STUFFING AS YOU GO. Rd 6: slip st in next 3 sc, ch 1, sc in same sc as last slip st, sc in next 3 sc, (sc2tog) 4 time, sc in next 4 sc. (12) Change to gray. Rw 8: Ch 1, turn; sc in next 5 sc, change to black, sc in next 2 sc, change to gray, sc in next 5 sc. (12) Change to black. Rw 16: With wrong side facing, skip next 2 sc, attach gold in next sc, ch 1, sc2tog, sc in next 8 sc, sc2tog, leaving remaining sc unworked. Finish off. Using black, embroider black line down front gray section of BOOTS. Place BOOTS on LEGS and sew back seam closed. Weave in ends. Rw 7: Ch 1, turn; 2 sc in next sc, sc in next sc, change to black, sc in next 2 sc, change to red, sc in next sc, change to gray, sc in next sc, change to black, sc in next 5 sc. (12) Change to gray. Rw 17: With wrong side facing, attach gray in first sc, ch 1, sc in same sc as attachment, change to black, sc in next 2 sc, change to gray, sc2tog. (4) Change to black. Rw 21: Ch 1, turn; sc in next sc, change to black, sc in next sc, 2 sc in next sc, ch 3, working in sc on LEFT SHOULDER, 2 sc in next sc, sc in next sc, change to gray, sc in next sc. Rw 29: Ch 1, turn; sc2tog, sc in next 2 sc, change to black, sc in next 9 sc, change to gray, sc in same sc as previous sc. (13) Change to black. Finish off leaving a long tail. Using graph above and red, embroider “00” on front of BREASTPLATE. Sew RIGHT seam closed. Weave in ends. Finish off. Weave in ends. Using red, embroider lines on each side of gray section on COLLAR. BEGIN STUFFING BODY FIRMLY. CONTINUE STUFFING FIRMLY AS YOU GO ALONG. THIS WOULD BE A GOOD TIME TO PLACE THE BREASTPLATE ON S.P.D. SHADOW RANGER. IT WILL VERY DIFFICULT TO SLIP THE HEAD THROUGH THE NECK OPENING ON THE BREASTPLATE ONCE THE HEAD IS STUFFED AND CLOSED. Finish off with a long tail. Add more stuffing to firmly achieve desired shape. Weave tail through sc of Rd 44, pull tightly, and secure. Weave in ends. Sew LEFT UNDERARM to back of BREASTPLATE. Finish off leaving a long tail. Sew SHOULDER DOMES to shoulders of BODY stuffing before closing. Rd 1: With gold, sc in evenly around outside edge of BELT with 3 sc in each corner. Finish off leaving a long tail. Sew BELT BUCKLE to front center of BELT. Finish off leaving a long tail. Sew Rw 1 and Rw 6 together. Sew SWORD SCABBARD to BELT. Wrap BELT around waist of BODY and sew together. Weave in ends. Cut wooden skewer 5.5 inches from tip. Paint skewer silver. Rw 4: Ch 1, turn; sc in each sc across, ch 10, slip st in first sc. Finish off leaving a long tail. Wrap around SWORD BLADE, glue in place, and sew SWORD HANDLE closed. Rw 2: Ch 4, sc in second ch from hook, sc in next 2 ch, skip next sc, slip st in next sc. Finish off leaving a long tail. Fold SWORD HILT in half and sew together. Finish off leaving a long tail. Fold SWORD HILT WOLF HEAD in half and sew together and to SWORD HILT. Weave in ends. Finish off leaving a long tail. Using black metallic, embroider nostrils on HELMET. Weave in tail through sc of Rd 15, place HELMET on head of POWER RANGER, pull tightly and secure. Finish off leaving a long tail. Stuff HORNS firmly. Sew HORNS to HELMET. Finish off leaving a long tail. Sew FOREHEAD PLATE to HELMET. Pokemon are copyright Nintendo and their respective creators. Power Rangers are copyright Saban Entertainment and their respective creators. This crochet pattern is an original pattern and is © by Christjan Bee (February 2017). Please do not claim this pattern as your own. If you wish to share this pattern, you may link to this pattern but please do not reprint/repost it on your site. You may print and keep a copy for your own personal use but you may not sell or distribute it, or sell items made from this pattern.